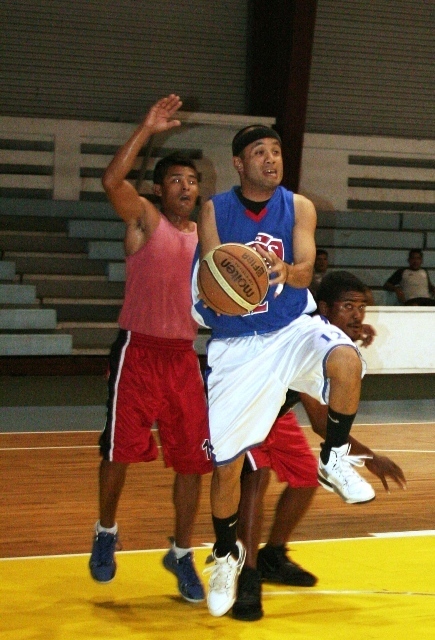 Teams Ministry of Justice (MOJ) Lawmen and Sam’s Sharks cam out guns blazing as they went on to beat respective rivals, Wednesday night in the ongoing 2013 season of the Rudimch Enterprise Government/Business League at the Palau National gym. After exploding in the opening tip off, the MOJ Lawmen never looked back as they spanked MOH Band Aid, 94-51. The Lawmen meant business after taking a 39-7 lead in the first and then closing the half with a 65-29 advantage. It was all MOJ Lawmen in the second half as they breeze their way through for the win with Bisa Demei leading the way with 18 points while Teruo topscored for MOH Band Aid with 25 on the losing end. On the other hand, Sam’s Sharks kept their winning mode as they dispose of Galaxy Builders, 90-89. Armando Canseco provided steady scoring for Sam’s Sharks as he finished the game with 21 as teammate Wade Rdechor chipped in 19 as they now take a 3-1 win-loss record in the Business Division while King tallied 34 points for Galaxy Builders but was not enough as they now sport a 1-3 tally. In other games, Island Rhythm won over MOE Spiders, 20-0; Neco defeated PPR Stingrays, 103-85; Hanpa Cardinals beat President’s X-Men, 85-83; RTRMI Crushers outscored Mason’s Hardware, 99-76; and MOF Omsangel downs PPUC Electric Eel, 87-85. Games resume tonight with PPUC Electric Eel versus KSG Royals at 6 p.m. followed by the Neco-RTRMI Crushers match at 7:30 p.m. while WCTC will face Fish N’ Fins at 9 p.m.
Monday night games will have MOF Omsangel against President’s X-Men at 6 p.m. as Hanpa Cardinals will face MOE Spiders at 7:30 p.m. while Fish N’ Fins will test PPR Stingrays in the night cap at 9 p.m.